Asparagus Recipes. asparagus vegetarian recipes. Asparagus is a green vegetable which has a long, erect stalk with little spear like leaves at the end. In India these are considered as a gourmet ingredient but are used more commonly in the western world. One of the unique things about it is the earthy flavor it has. Many a times the stalks get hard and they have to be removed before eating and that’s why the younger stalk is preferred as it is softer. Asparagus in low in sodium and is mostly made up of water which not only makes it healthy but also good for weight loss. The most basic asparagus recipes for a snack or a starter is a Sesame Asparagus Stir-Fry. This is usually served in Chinese restaurants and homes as a starter before the main course. Asparagus spears taste amazing with bread. You can go the traditional route by serving them up as a bruschetta or you can make something different like Cold Asparagus Rolls. These rolls are super simple to make, hardly take any time to prepare and taste wonderful. Asparagus and onions make a great pair. The reason onions are added to the Fresh Asparagus Soup is to enhance its flavor and gives it an intense flavor. You can serve this along with croutons or garlic bread. You can even add chopped asparagus to Vegetable Dumplings along with other veggies and serve this delicious snack with soy sauce and a red chilli sauce. Asparagus is such a wonderful ingredient to add to any dish. Rosti is essentially a breakfast item made with potatoes. This innovative twist of Noodle Rosti topped with Asparagus sauce easily transform this dish from a breakfast to a dinner recipe. The Chinese white sauce with pieces of asparagus adds to the flavor of the rosti. We always need some kind of gravy while we eat out Chinese noodles or rice and Stir-fried Greens in a Spicy garlic sauce is the perfect gravy for that. The crispy vegetables add an amazing texture to the spicy gravy. This vegetable also goes very well in Italian dishes as well. For a crunchy texture, you can add pieces of asparagus to Penne with Cheesy Vegetables or sprinkle them over a Creamy Corn Pizza. The exotic combination of corn and asparagus also works well in baked dishes. Baked Corn with Asparagus is a dish that will be loved by everyone because of how creamy it is with the addition of tons of cheese. Look here for chopped asparagus recipes. Hope you enjoy the Asparagus Recipes. 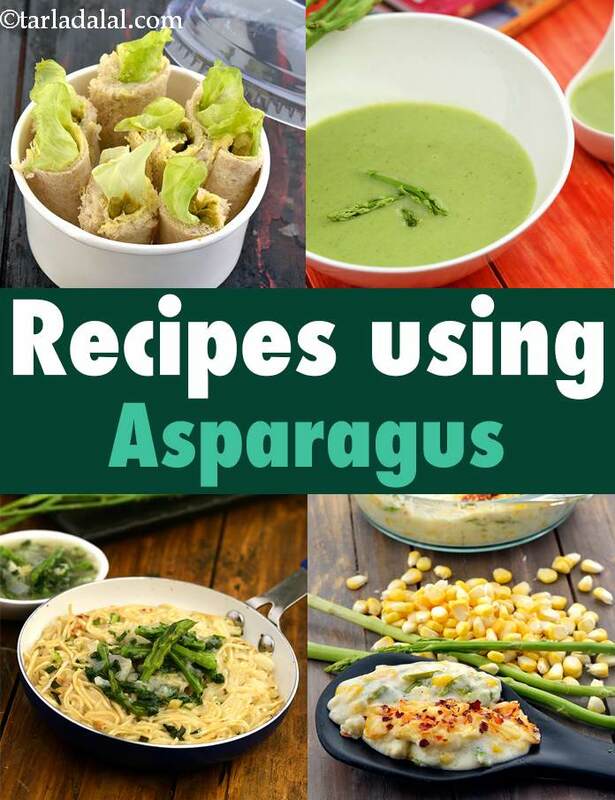 asparagus vegetarian recipes. This rich, thick, creamy fondue made with asparagus and a generous portion of cheese, goes well with potato wedges and pita chips. For the health conscious..... a light and calcium bound dish.